• The essays – introduce the chapters with the reprinting of a curated set of essays and excerpts by various authors that uniquely address how particular structural elements or systems relate in essential fashion to architectural design concepts. • The model studies – physical models of the overall structural systems of several notable contemporary buildings from Europe, North and South America, Africa and Asia are illustrated with large photographs, detail close-ups, and views of their external forms and internal spaces that establish the exceptional qualities of these projects in connecting structural form to architectural design objectives. Mosaic layouts complete the chapters with a collection of photographs of yet more models whose particular details and unique features serve to extend the visual repertoire of the structural type being considered. The combination, juxtaposition and mutual positive reinforcement of these two collections, one largely textual and the other image based, provides the reader with unique and multifaceted insights into how structural forms and systems can be related to architectural design intentions. Conveyed by a strong and deliberate graphical design format, this assembly of materials gets to the very essence of structures within the context of architecture, and will inspire students and practitioners alike to make strategic design decisions for their own projects. 1. Columns. Auguste Perret and the Concrete Column. Mies’ Columns: Barcelona and Beyond. Villa Mairea’s Columnar Variations. A Forest of Minimal Columns. The Sendai Mediatheque and its Tube-Columns. Model Studies. 2. Walls. Barragán’s Walls and Color. Inca Walls at Ollantaytambo. Schindler’s Metaphysical Walls. Ando’s Ephemeral Concrete Walls. The Sculpted Walls of Richard Serra. Model Studies. 3. Beams and Slabs. Arresting Cantilever Deflections. Nordic Pavilion - An Illuminating Beam Matrix. The Kimbell’s Beam Variations. The Iron and Steel Beam Evolves; Mies Follows Suit. Chinese Building Traditions Meet Modernism. Nervi’s Isostatically Inspired Ribbed Floors. Maillart Minimalism: The Flat Slab Emerges. Concrete Takes Flight. Floor Plate-Defined Façades. Model Studies. 4. Trusses. La Tour Eiffel : A Truss, and More... Truss Forms and Style Battles. Truss Forms and Design Collaborations. Neimeyer’s Subtly Deceptive Trusses. Metabolism and the Space Frame. Tensegrity and the Architecture of Life. Model Studies. 5. Frames. To Frame - or not to Frame... Framing Views, Framing Victory. Breuer and Nervi’s Folded Frames. Braced Frames and High-Tech Dreams. Informal Frames. Model Studies. 6. Cables, Nets and Membranes. Seemingly Free Form Structures in Montréal and Munich. Cybernetic and Lightweight Dreams. Stayed Roof Systems and High-Tech Identity. Jugaad : Suspending a Communal Canopy. Marsyas : Structure and Metaphor. Model Studies. 7. Arches, Domes and Shells. Informing Arch Form. Veiled and Vaulted Space. Domes as Optical Instruments. The Politics of Candela’s Shells. SANAA’s Ceilings and Skies. Model Studies. Afterword. Models are Real. A Model Curriculum. Index. Mark R. Cruvellier is the Nathaniel and Margaret Owings Professor and Chair of the Department of Architecture at Cornell University, USA. 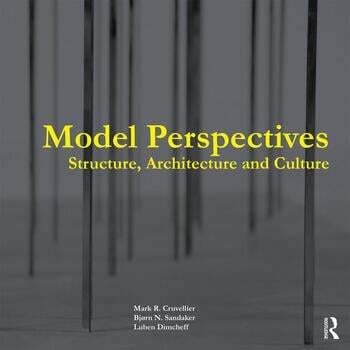 He teaches and conducts research in the area of structural form and behavior considered within the context of architecture; he is co-author of The Structural Basis of Architecture, 2nd ed. (Routledge, 2011) with Bjørn N. Sandaker and Arne P. Eggen. Cruvellier is a professional structural engineer and has been involved in built projects from skyscrapers in New York City to wilderness footbridges in British Columbia. Bjørn N. Sandaker is Professor of Architectural Technology at The Oslo School of Architecture and Design (AHO), Norway, and Adjunct Professor at the Norwegian University of Science and Technology (NTNU) in Trondheim, Norway. His particular academic interest focuses on the borderline between architecture and structural engineering; he is author of On Span and Space: Exploring Structures in Architecture (Routledge 2008) and co-author of The Structural Basis of Architecture, 2nd ed. (Routledge 2011). Luben Dimcheff is the Richard Meier Assistant Professor in the Department of Architecture at Cornell University, USA, where he teaches studio as well as courses that are focused on the visualization and analysis of space. He leads a design and architectural practice based in New York City with projects built internationally.